Home › Stringed Instruments › Cello › ammoon Hardwood .. 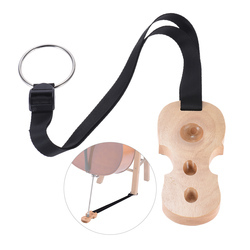 The cello endpin holder made of solid wood, it features unique cello-shape, 3 holes for setting endpin, the adjustable woven strap free for players to a comfortable length, and the non-slip pad on its back offers it great slip resistance. 3 holes for setting instrument endpin, free for you to adjust the setting angle. Sturdy woven strap can be adjusted from 40cm to 77cm, accommodate most players. Made of solid wood, with compact workmanship. Stylish cello-shape, portable size for carrying easily.